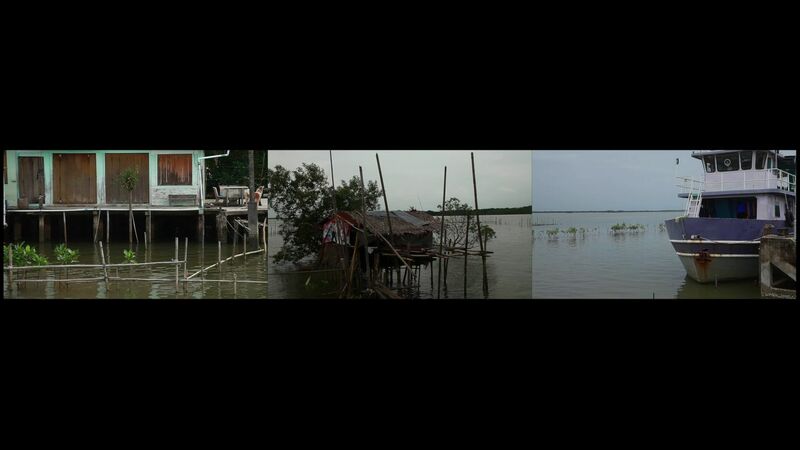 For this exhibition by Araya Rasdjarmrearnsook, Gimpel Fils presents three new works: Cuckoo, Niranam and Same Sea. The format is the same: wide-angle, split-screen and mostly static camerawork. The themes are a development of Araya's recent film work, which portrays Thai dogs, mostly strays, which the artist has rescued. In Cuckoo, the left screen depicts a bed with white crumpled sheets and a window to the exterior, while the right portrays a succession of dogs feeding off iron pots or pans, filmed from above so that their faces are never visible. It then emerges that the crumpled sheets hide a reclining figure, who will disappear at some point without ever becoming visible. On the other hand, a dog has entered the room and climbs onto the bed, seemingly gazing at the figure and later, at the imprint left by the absent person. In contrast to the sharp, scratchy sound of the feasting dogs, a slow chant overlays the whole scene. In Niranam (Nameless), a figure stares out to sea on the left screen, perhaps the same sea visible in the right-hand screen. A fixed viewpoint captures a rear-view of the watcher, whose hair blows about in the wind. The only sound is that of the sea and once again, we never see the face of the viewer. Finally, in Same Sea, the split screen reveals sea dwellings on stilts, again from fixed viewpoints. The sound of women's chatter is gradually displaced by a singular sound, which might be a fisherman bailing out his boat. Wistfulness and loss set the tone of these films, as it does of a series of photographs which are included in the exhibition. These photos commemorate a named dog, deceased, who is pictured next to a ghostly figure, with the sea as background. The figure of a woman shows her as ethereal, ghostly, while the dogs are depicted as living. Perhaps the woman has accompanied her dogs into their afterlife. Although stylistically different from Mayan Deren's Meshes of the Afternoon (1943), there is a dreamlike element present in the ghostly figure of Cuckoo and in the ever-present but faceless viewer in Niranam. 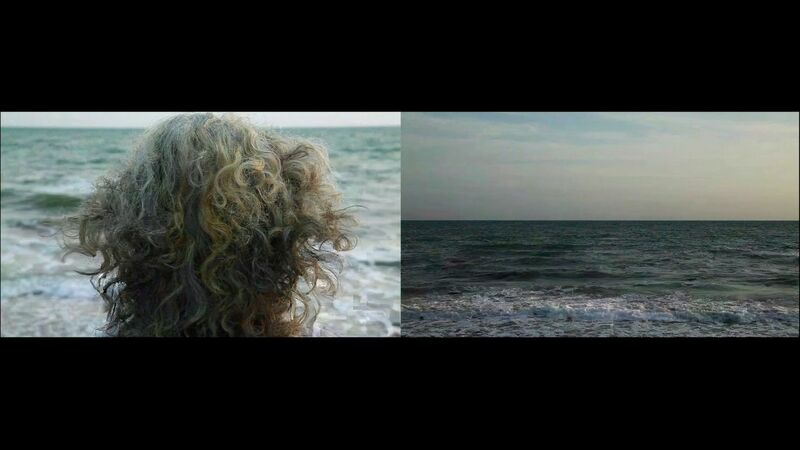 Araya's sea motif also echoes the sea and seashore as symbols of mysterious renewal, ever-present in the endings of many Fellini films (La Dolce Vita, 8 1/2, Juliet of the Spirits...). The filmic history of the seashore as redemptive, as the interface between earthbound complexity and the void offered by a limitless horizon, finds its place even now, in the newsreels of refugees fleeing conflict across the sea and finding sanctuary on the shore. Araya Rasdjarmrearnsook is a Professor of Fine Art at Chiang Mai University, Thailand and has exhibited widely. She represented Thailand at the 51st Venice Biennale in 2005 and has participated in numerous international festivals and biennales, including, the 5th International Video Art Bienniale, Tel Aviv, Israel (2010) Sydney Biennale, Australia (2010); 55th International Short Film Festival Oberhausen, Germany (2009); and Poetic Justice, 8th International Istanbul Biennial, Turkey (2003). She will be participating in the upcoming Singapore Biennale. This is her fifth solo exhibition at Gimpel Fils.